I am the Chief of my people, the Micmac Tribe of Indians in your Province of Nova Scotia, and I was recognized, and declared to be the Chief, by our good friend Sir John Cope Sherbrooke, in the White man's fashion, twenty-five years ago. I have yet the papers which he gave me. Sorry to hear that the King is dead. Am glad to hear that we have a good Queen, whose Father I saw in this Country. He loved the Indians. I cannot cross the Great Lake to talk to you, for my Canoe is too small, and I am old and weak. I cannot look upon you, for my eyes do not see so far. You cannot hear my voice across the Great Waters. I therefore send this Waumpum and Paper talk to tell the Queen I am in trouble. My people are in trouble. I have seen upwards of a thousand Moons. When I was young I had plenty, now I am old, poor and sickly too. My people are poor. No Hunting Grounds, No Beaver, No Otter, No Nothing. Indians poor, poor forever, No Store, No Chest, No Clothes. All these woods once ours. Our Fathers possessed them all. Now we cannot cut a Tree to warm our Wigwam in Winter unless the White Man please. 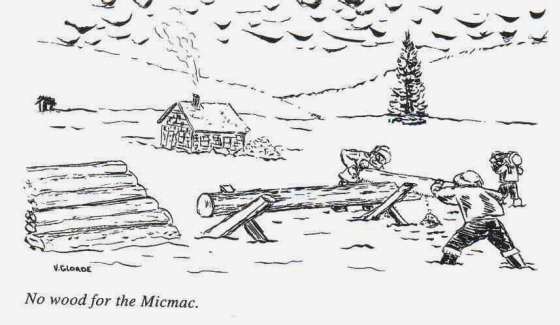 The Micmacs now receive no presents but one small blanket for a whole family. The Governor is a good man, but he cannot help us now, we look to you the Queen. The White Waumpum tell that we hope in you. Pity your poor Indians in Nova Scotia! White Man Has taken all that was ours, he has plenty of everything here, but we are told that the White Man has sent to you for more. No wonder I should speak for myself and my people. The man at left is not known; beside him stands Judge Christopher Peminuit Paul, with white hair and goatee, son of Louis Paul. 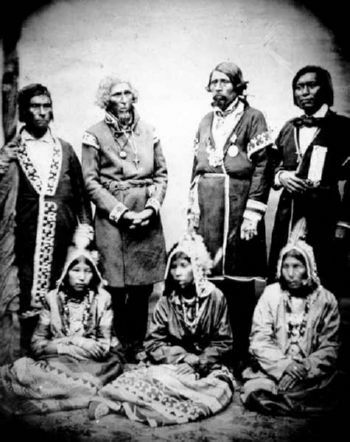 Third from left is Paul's cousin, Chief Jacques-Pierre Peminuit Paul of Shubenacadie, known to the Mi'kmaq as Saq Pie'l Sakmaw, and to the English as James Peter Paul. Next to him is his adopted son, John Noel, child of his second wife by her first marriage. The occasion is probably the installation of Peminuit Paul as Chief, at St. Mary's Cathedral, Halifax, 15 September 1856. At this time he was presented with Pope Pius IX's gift of a medal, which he wears in this and subsequent photos. Jacques-Pierre was born 5 January 1800, at Rocky Lake, and died 10 January 1895 at Shubenacadie. He was succeeded as chief by John Noel. The ladies are not identified, but the one at left wears a skirt known to have been made for the woman who later became John Noel's second wife (Marie Antoinette Thomas, at this point still the wife of Peter Sack). The woman's skirt at far right appears in later photographs on Mary Babaire, wife of Christopher Peminuit Paul; on Marie Antoinette's sister Madeleine Thomas, wife of John Williams; and on Marie Antoinette's daughter, Catherine Sack, wife of Stephen Maloney. These elaborate skirts seem to have been lent out among this extended family for photographic or ceremonial occasions, and appear in photographs as late as 1930, so positive identification of the wearer is difficult. The Marie Antoinette Thomas Sack Noel skirt is now in the collections of the Nova Scotia Museum. The election of a Chief for the Micmac Indians, was held on the Indian Reserve, near Shubenacadie, on the 12th inst., and resulted in the raising of John Newall, an old resident of the place, to that much coveted position. The death of (Grand Chief) James Paul, the old Chief, who had served the tribe for quite a lengthy period, took place about two years ago. He was considered by his whole band of followers as a "great man," as they thought he displayed at times, supernatural powers. A story to the effect that he once stopped the motion of an immense windmill in Dartmouth, by merely laying his hand on the arm to which the sails were fastened, is authentically believed by the total Micmac tribe. It is also told of him, by his survivors, that he could bend the stem of his clay pipe around his hat, and would carry it in that position – straightening it out again without breaking, whenever he wished to use it. At the demise of this "great man," Steven Maloney was elected as his successor, but many of the Indians at the Reserve would not recognize him as their leader, and have now had the election, by which he was made Chief set aside on the grounds that it was illegal; the Government not being notified, and no permission obtained to elect a Chief. Steven says the reason his people did not like him for Chief, was because he would not preach to them. On the above plea, the election on the 12th was held. During the campaign and polling, the Indians were orderly – quite as much so as the more civilized whites were a few weeks previous, when the elections were held for the Local representation and, in this County, for Dominion Parliament. Most of them were exceedingly quiet, but there were a few, who, like the white orators, wished to display their eloquence, and did considerable speechifying. At the closing of the Polls, when it was made known that John Newall was elected, the victorious party gave vent to pent up feelings, by simply giving three cheers and waving their hats. – Truro News.